MindGenius Ltd are delighted to announce the release of the German version of its leading mind mapping software, in conjunction with Haage and Partner, their German reseller. MindGenius German is functionally exactly the same as the English language version, and includes a wide variety of German language templates for business and education to help get users started quickly with MindGenius. MindGenius can be used to brainstorm for innovation, and generating new ideas, plan strategies, projects, events, tasks and workload, rapidly gather project requirements and risks, and capture the conversation and actions during meetings. 2014 – a new year begins! If we haven’t already done so, most of us are in planning mode and setting out business, departmental, team and personal objectives. One definition of the term “Objective” is: “a statement of a specific result or outcome that a person is aiming to achieve within a defined timescale and within available resources”. The same definition can of course apply to team or organisational objectives. All around the globe, towards the end of 2013 and at the beginning of this New Year, many individuals, teams and organisation have been harnessing the power of MindGenius to map out and, more importantly, focus on their plans, priorities and key objectives for the coming year. With that in mind, I decided to focus on the all important aspect of personal objectives for this month’s Newsletter and share some sample Maps with you. Also included are some hints and tips on how MindGenius can be applied and add value to this area of work. As MindGenius users will testify, the most basic function of using the mapping method to capture initial thoughts on what your objectives might be brings instant benefits in terms of being able to set out initial thoughts, visualise the information and bring focus and clarity to the ideas, information, knowledge, etc., being captured. The “drill-down” effect of adding sub-branches to any appropriate level provides a method of capturing depth of thinking and inter-related thoughts / ideas relating to each subject matter – “thinking things through thoroughly” as I like to sometimes call it. Part of that initial idea generation and capture would then invariably introduce the easy and quick functionality of the “drag and drop” moving of branches into order or hierarchy. The use of Map Explorer really helps with creating and navigating large amounts of information and being able to both focus and build on aspects or topics in digestible easily-understood segments. 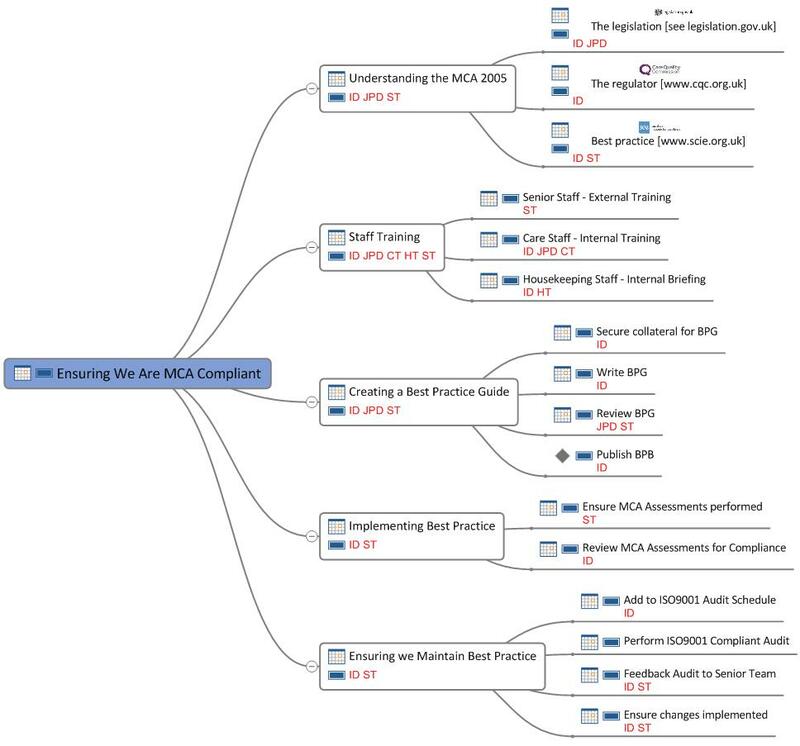 The Notes pane also adds value to the mapping process – in terms of personal objectives, this functionality lends itself to recording important comments, highlights, factors, points of interest or reference against each topic / objective. A point worth mentioning at this stage is that, no matter what your role or function is within the business or organisation, the simplicity and ease of use at this basic level - of quickly capturing your ideas and knowledge, structuring your ideas, and being able to easily navigate, explore and visualise each and every aspect – brings wider collaborative benefits of all-important focus and clarity to any exercise requiring clear and concise planning and understanding (of which objective setting is only one). Another point is that, regardless of which standards or models you work to from a procedural or process point of view, MindGenius allows you to quickly build up, shape and mould your objectives around any requirement. 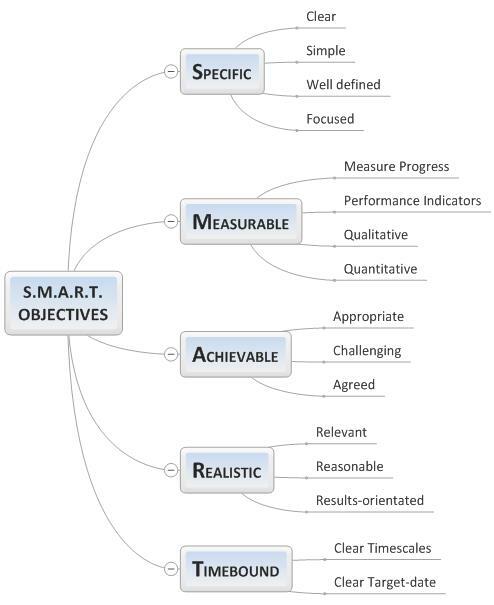 As an example, the sample Map below depicts the common “S.M.A.R.T” model for setting objectives. 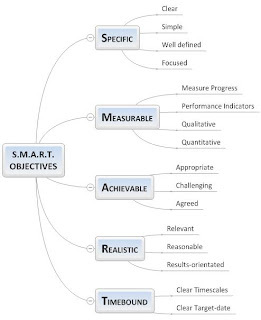 Mapping and visualising each of your objectives (and maybe even using the Notes to write up the actual objective statements) provides a good visual platform to enable you to check against the “S.M.A.R.T” criteria. Once the objectives are drafted, agreed and finalised, the maps usually become the “working documents”. One example of this could be using maps in a review meeting (e.g. weekly, monthly or quarterly) to discuss progress with, and performance in, each Objective. Using Categories (Analyze Ribbon) provides the ability to score or rate each Branch (Objective). The sample screenshot below shows the use of two category sets (Performance and Numbers) only to show two types for demonstration purposes. You will also notice the use of the Notes pane. Remember also the use of Filtering (Analyze Ribbon / Quick Filter) to filter on any type of category applied, enabling quicker and more intuitive analysis and interpretation of the map / data. One practical use for tracking and managing progress over a long period (e.g. months or a reporting year) is to apply a performance rating to each branch (Objective) at each review. Then at the end of the reporting period copying and pasting them into one “Master” map will allow you to examine and analyse the overall performance pattern over the whole period. There are of course many other uses and applications of MindGenius in formulating, communicating, reviewing and managing personal objectives, I hope to cover those in future Newsletters, but if you have any enquiries about this aspect of MindGenius use that you’re not sure of or would like further help with, please email me at info@mindgenius.com. Also, we’d love to hear from you if you would like to share how YOU use and apply MindGenius for managing objectives (or in fact any other use!) simply pop us an email, attaching the relevant map(s) if you can. Remember also, MindGenius Ltd provide an extensive range of tailored training and consultancy solutions for individuals and teams. If you need to gain a better understanding of how MindGenius can improve your current processes for managing objectives, simply contact your Account Manager or email info@mindgenius.com and we can discuss your options. St Omer Residential Home is based in Torquay, Devon and was established as a Care Home in 1983. Care Homes must comply with the Care Standards Act and their staff must be up-to-date with all the latest best practice and training. In the summer of 2010 St Omer invested in MindGenius to support staff who were undertaking their National Vocational Qualifications (NVQ’s). The staff continue to use MindGenius when undertaking formal and informal training and continue to reap the many benefits. Following the successes achieved by the staff, the management team started to use MindGenius to support the management functions of the business. Over the past three to four years St Omer have been managing in what can best be described as a rapidly changing, competitive and somewhat hostile environment. Since 2009 they have been inundated with a constant flow of statutory changes and requirements; and have had to react in a fleet footed and imaginative way to many of these new challenges. In many cases St Omer have been responding to legislative changes, and as many will appreciate these legislative changes are often completely opaque and require considerable analysis; firstly to understand what the legislation is trying to actually achieve in the first place and secondly what needs to be implemented to meet those changes and challenges. In late 2010 Ian Day, the owner of St Omer decided to further extend the use of MindGenius to help implement those legislative changes. Traditionally they would have treated each legislative change as a discrete project in its own right and managed the implementation with MS Project. Ian’s decision came about because his background was project and programme management in, typically, FTSE 100 sized companies. 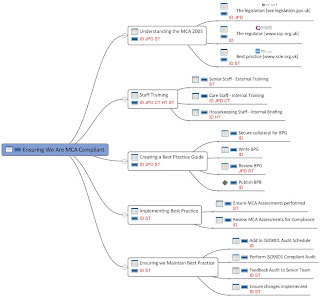 Ian had realised some time before that while MS Project is ideal for creating a WBS, identifying Milestones and Resources and capturing progress, MindGenius was better suited to capturing and communicate ideas as well as reflecting a dynamically changing situation. The project related to the Mental Capacity Act 2005, a hot topic in Social Care and with our regulator the Care Quality Commission. “It is rare in SME’s that you have the time, resources and on occasions the expertise, to operate a classic project lifecycle. Rightly or wrongly you often start work without a clear or fully formed idea of ultimate goal or deliverable. What you often know is that ‘the destination lies somewhere over there and looks something like this’. These somewhat intangible concepts still need to be wrapped up within a structure that is manageable and explainable to all involved in the project; and this is where I have found MindGenius comes into its own. MindGenius enables you to capture what might start off to be a somewhat nebulous concept of an end point and gradually peel away the layers without the tool getting in the way of the process, yet maintaining a structure and communication vehicle at the same time”.